Jefferson Nickel was first issued on November 15, 1938. The third president Thomas Jefferson's bust appears on the obverse, the reverse depicts his Virginia home, Monticello, which Jefferson himself designed. During the World War II(1942-1945), the metal composition changed temporarily and Nickel(critical war material) replaced by Silver. To commemorate the Westward journey by Lewis & Clark, the US mint released specially designed nickels during 2004-2006. Also, We have complete sets, please check bottom of this page. 2009 Nickels are not in good condition. They are technically Uncirculated but have heavy contact marks. In 2004, US Mint issued special nickels called "Westward Journey Nickel Series" to commemorate the bicentennial of the Louisiana Purchase and the journey of Lewis & Clark. Total five specially designed nickel coins were issued until 2006. This set has all the nickels issued from 1964 through 2019, all D, P, S mint coins including '82, '83 and Westward nickels. All uncirculated coins packed in 3 coin tubes. No proof coins. Albums or Folders are NOT included, you need to buy them separatley. 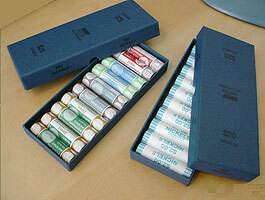 You can store 10 Nickel rolls in one box. Size: 9 1/4" x 4" x 1 1/8"
For Shield Nickels(1866-1883), lease click here.